The recall, which impacts 2,263 Porsche 911 Carrera and Carrera 4 models, was issued because the tail pipe may unexpectedly separate from the muffler due to a manufacturing error. Porsche is recalling certain 2012-2013 911 Carrera and Carrera 4 models because the tail pipe may unexpectedly separate from the rear muffler. As a result, the detached tail pipe may become road hazard and increase the risk of a crash, according to the National Highway Traffic Safety Administration. The recall affects models manufactured from March 7, 2012, through November 12, 2012, and equipped with a standard exhaust system. Vehicles manufactured with a port exhaust system are not affected by the recall. A total of 2,263 Porsche 911 Carrera and Carrera 4 vehicles are involved. Porsche will being notifying customers of the recall momentarily, but has not issued a recall schedule. Authorized dealers will replace the rear mufflers, free of charge. In the meantime, Carrera owners can contact Porsche at 1-800-767-7243. Concerned drivers can contact the National Highway Traffic Safety Administration’s Vehicle Safety Hotline at 1-800-767-7243 or go to www.safercar.gov. Porsche’s safety recall number is AD01. The issue first arose in May 2012 when Porsche observed a fracture in the circular welded seam on the rear muffler of an internal test vehicle. As a result, Porsche and its supplier conducted internal inspections and component testing. In order to correct the flaw, Porsche equipped vehicles with reinforcement components and conducted endurance testing. Porsche is not aware of any customer-owned instances of tail pipe detachment. According to the automaker, all defects were reported on Porsche test vehicles with over 25,000 miles. Consequently, Porsche determined that the Carrera’s exhaust system did not meet service life requirements, which led to the recall. Although Thursday’s recall is the first of 2013 for Porsche, the automaker issued several recalls last year, including the recall of nearly 102,000 model year 2011-2012 Cayenne SUVs to fix a headlight detachment flaw. The February 2012 recall was prompted by 39 cases of headlight loosening and 68 cases of detachment. 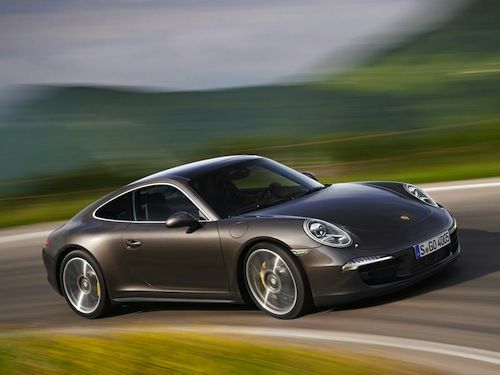 The luxury automaker also issued a recall in May of last year concerning 1,232 model year 2012 Porsche Carrera S vehicles over possible fuel line failure. According to the recall notice, interference between a coolant line and fuel line may cause the fuel line to disconnect. Consequently, fuel leakage may occur, which may increase the risk of a crash and/or fire. In July 2012, Porsche recalled 270 model year 2011-2012 Panamera Turbo and Turbo S cars, as well as 2012 Cayenne Turbo crossovers, due to a turbine wheel defect. Affected vehicles may suffer from a fracture in the vehicle’s turbine wheel, which could result in turbine shaft breakage. A broken turbine shaft may result in oil leakage and increase the likelihood of a crash.